Tanks on the old Erie Railroad; Canisteo Valley New York 1987. In March 1987, I made a trip to the scenic Canisteo Valley where I photographed trains on the former Erie Railroad. I made this view at the Canisteo River Road crossing at West Cameron, New York of DODX 6-axle flats carrying tanks. This was an eastward Conrail BUOI (Buffalo to Oak Island) freight and it was rolling along at a healthy speed. At the time, I was experimenting with my black & white process. Unfortunately, I should have experimented with film of subjects that wouldn’t have been so interesting to me 30 years after the fact. This roll of 120 film has been largely unseen since the 1980s. My ineffective trial yielded uneven processing and negatives that were difficult to print with poor tonality. Today, I think the subject matter is fascinating despite the inept process. The irony was that I was adapting a formula recommended to me by former New York Central photographer Ed Nowak. The lesson here is don’t allow a New York Central photographer advise you on how to process photos of the Erie Railroad! (Railroad photography humor). CSX SD40-2 on the old Erie: Delaware & Hudson Sealand Train, Attica, New York. In September 1988, I was set up at Dixon’s on Conrail’s former Erie Railroad line over Attica Hill. Roaring up the grade with a CSX SD40-2 in the lead was this Delaware & Hudson Sealand doublestack land-bridge train bound for Little Ferry, New Jersey. The New York, Susquehanna & Western had just been appointed designated operator of the D&H, and NYSW locomotives were common on many D&H road freights. Land-bridge trains, such as this one, reached the east coast via Delaware & Hudson trackage rights over Conrail’s former Erie mainlines between Binghamton and Buffalo, New York, and NYSW’s rights on the old Erie east of Binghamton. Catching a CSX painted locomotive was a rare find in western New York in 1988, and finding one leading on the Erie seemed like a special treat. This represents window in time in the dynamic melting pot of western New York railroading in the late 1980s. After exposing this black & white view using my dad’s Rollei model T, I followed the train east and exposed dozens of photos along the way. July 30, 1987: Conrail SD45-2s downgrade at Bennington Curve. Less often photographed than the famous Horseshoe Curve, is Bennington Curve further up the old Pennsylvania Railroad Main Line grade toward Gallitzin, Pennsylvania. Back in July 1987, my pal TSH and I camped near the curve. I was kept awake by the roar of uphill diesels and the ear-piercing flange squeal of wheels in the curve. At sunrise I was track side to photograph the action. One of my first images of the morning was this black & white view of a light helper set returning down grade toward Altoona to assist a westward freight. In 1987 my choice film was Kodak T-Max 400, then a relative new emulsion. After about a year of work with T-max, I returned to using older emulsions such as Kodak Tri-X, which I felt produced better results. At that time Conrail routinely assigned its 13 former Erie-Lackawanna SD45-2s as helpers based at Cresson near the top of the hill on the West Slope. Conrail at the Portage Bridge Letchworth Park, New York. On the morning of May 9, 1987 I exposed this view of Conrail’s BUOI (Buffalo to Oak Island) easing across the former Erie Railroad Portage Viaduct over the Genesee River at Letchworth Park. I was working with my father’s Rollei Model T that he purchased in Düsseldorf, Germany 28 years earlier. My film of the day was Kodak T-Max 400 (TMY). Conrail Classic—SD50s on the move! A grab shot along the old Erie Railroad. On May 2, 1987, Doug Eisele and I spent the day photographing trains on Conrail’s former Erie Railroad. We been following Conrail TV301, a double-stack train carrying APL containers on a transcontinental land-bridge movement toward the west coast. At the time, the Erie route was preferred for double-stacks. At Dalton, New York we spotted an eastward Delaware & Hudson stack train carrying Sealand containers. This was crawling along the old Erie eastbound number two track at about 10mph, as Conrail didn’t maintain the eastward track for anything faster than that, and instead preferred to route all movements over the number 1 main. As the Conrail train was flying along, we pulled over and bailed out the car; and I made this hastily composed photograph with my father’s Rollieflex Model T on Kodak TMY (Tmax 400). While not a perfect composition, for me this captures the spirit of the moment, and shows the old Erie Railroad alive with heavy freight. Helpers at Lilly: Conrail November 1998. Big Blue had just six full months left. Mike Gardner and I made another epic whirlwind trip to Pennsylvania to catch Conrail on the move while we could. I made this view of a helper set working the back of a westward (down hill) freight looking down a side street in Lilly, Pennsylvania. 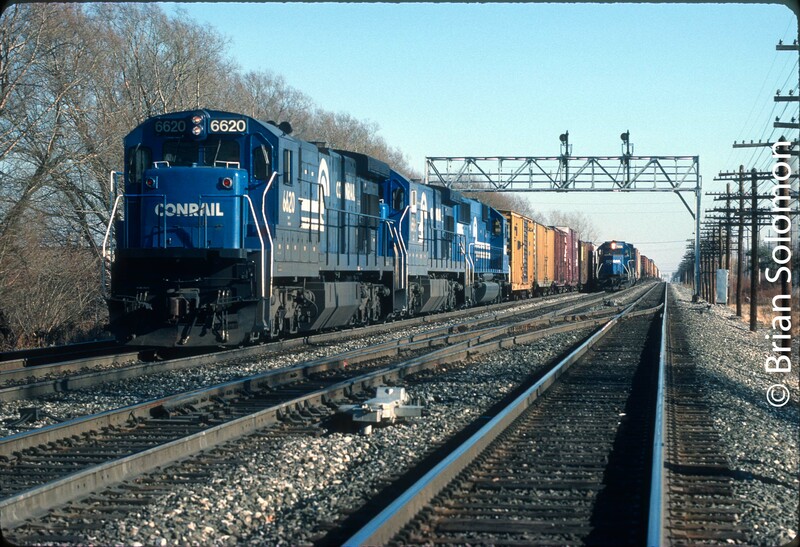 There’s nothing like a bright clear day in November, especially with Conrail’s brilliant blue paint. Exposed on Fujichrome with a Nikon N90s. Drama on the West Slope: Conrail SD50 at Mineral Point. September 5, 1997—the still late summer air is shattered by the roar of Conrail SD50 6711 in run-8 working an eastward coal train on the ‘West Slope’ at Mineral Point, Pennsylvania. This was Conrail’s former Pennsylvania Railroad’s busy mountain mainline that crested the Alleghenys at Gallitzin, Pennsylvania a favorite place to photograph in the 1980s and 1990s. Exposed on Fujichrome with my first Nikon N90 and Nikkor 80-200 AF zoom. Misty Morning at Spruce Creek, Pennsylvania, April 1, 1988. Kodachrome 25 slide exposed using a Leica M2 with 50mm Summicron. It was Conrail’s 12thbirthday! And that was many years ago. My old pal TSH and I were exploring the former Pennsylvania Railroad Middle Division and visited Spruce Creek where we photographed this eastward freight. The old heavy-weight sleeping car converted for Penn-Central/Conrail maintenance of way (work equipment) makes the photograph fascinating. I’d never seen cars like this in revenue service and simply having relics like it on the move connected me to an earlier era. Seeing this Kodachrome 25 slide makes me yearn for the days when we’d be trackside on Conrail and never know what might pass. It seemed a like endless adventure and every train brought something new and unexpected. The weather? Not great, but I’d stand there now without complaint. On September 30, 1988, I was pacing westward Conrail freight OIBU-9 between Swain and Dalton, New York on the former Erie Railroad route from Hornell to Buffalo. From the window of my Dodge Dart, I used my Leica M2 to make this grab shot as I reached the head end of the train. My notes from the day indicate my exposure was equivalent to f4 at 1/250th of a second with Kodachrome 25; however I probably exposed this slide at f8 1/60th of second to enhance the effect of motion. The train had three EMD locomotives (at least one Norfolk Southern behind the leader) followed by 141 cars. 8:36 AM on September 30, 1988. Oh No, A Conrail Dud! 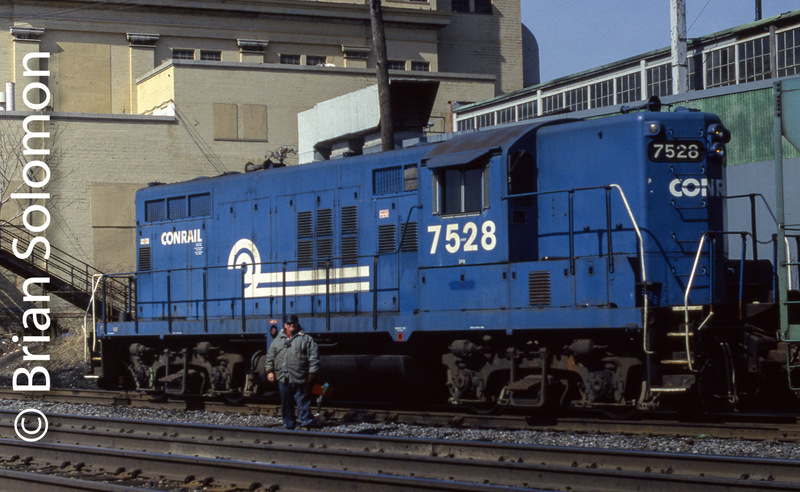 Here’s another 1980s Conrail photo. Not one of my good ones. This was also in the ‘seconds’ file, and in my opinion is un-retrievable. Poor show at Churchville, New York. 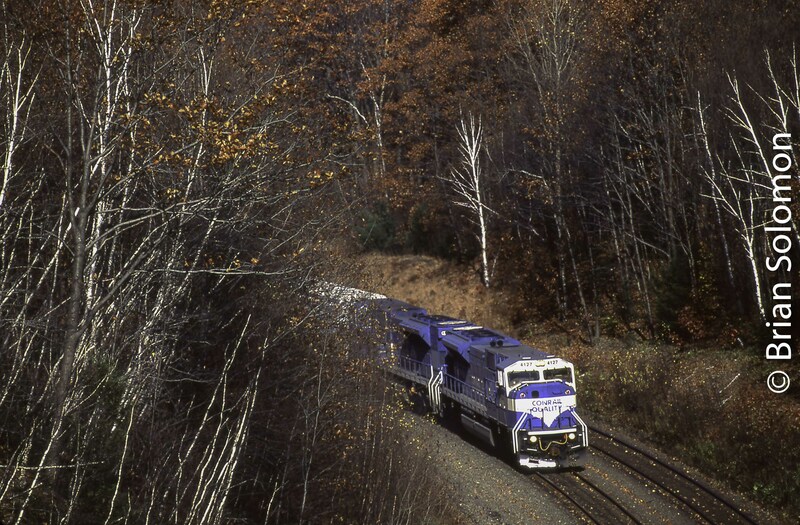 I missed the focus when photographing this westward Conrail intermodal train in autumn 1987. At the time, I made the photo I incorporated many of my favorite elements; signals, codelines, road freight blasting along through a curve. But, several things were amiss. The sun went in at the wrong moment leaving me with flat lighting; I failed to level the scene which produced a cockeyed image; however worst of all, I missed the focus! I was working with a 200mm lens mounted on a tripod and I didn’t pick the correct focus point. Poor show. No autofocus back then, so there’s no-one to blame but me. And unlike other flaws, focus isn’t easy to correct. Fear not! I have thousands of better Conrail images, where the sun was out, the camera was level and the desired point of focus was achieved. Tracking the Light is about process, not just obtaining perfect photos. 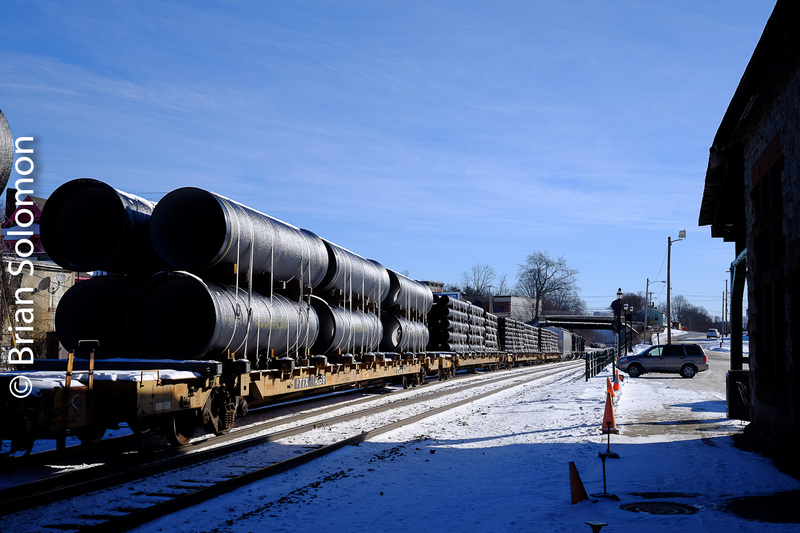 Conrail Slide Show Wednesday January 9, 2019. Conrail Office Car Special at Boston in November 1987. Tomorrow Wednesday January 9, 2019, at 730pm, I’ll be presenting a slide show on Conrail to the Amherst Railway Society in Palmer, Massachusetts. The program will feature some of my finest vintage slides; Kodachrome and otherwise. Conrail NHSE at Chester, Massachusetts. Westward Conrail MBSE ‘The Queen’ approaching the Pioneer Valley Railroad diamond in Westfield, Massachusetts—a scene much changed today. Amherst Railway Society’s Clubhouse is located in the old Palmer Grange building on South Main Street near the intersection with Route 32, a stone’s throw from the old Tennyville Bridge over CSX’s former Conrail—Boston & Albany—mainline. 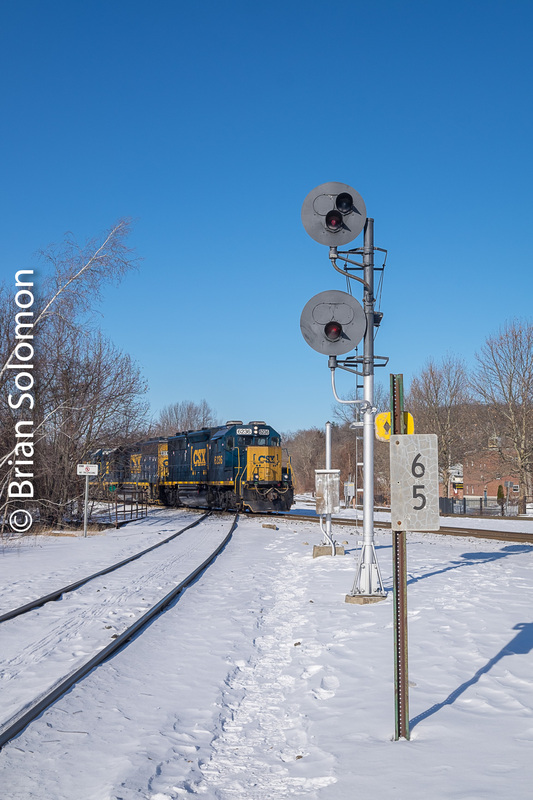 Brian Solomon’s Conrail Slide Show—Wednesday January 9, 2019. In Early October 1997, Conrail C30-7As lead a westward freight on the old Boston & Albany at Muddy Pond near Washington Summit at Hinsdale, Massachusetts. 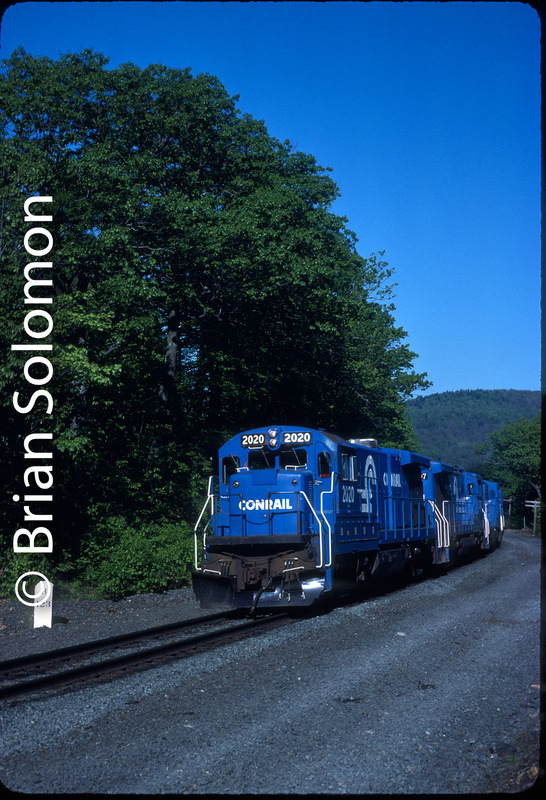 At 730 pm this coming Wednesday, January 9, 2019, I’ll be presenting a slide show on Conrail to the Amherst Railway Society in Palmer, Massachusetts. The year 2019 marks the 20thanniversary of the divide of Conrail operations between CSX and Norfolk Southern so I thought this would be a good time to reflect on Conrail’s operations. Amherst Railway Society’s Clubhouse is located in the old Palmer Grange Hall on the south side of South Main Street near the intersection with Route 32, a stone’s throw from the old Tennyville Bridge over CSX’s former Conrail—Boston & Albany—mainline. Ample parking is available. On the afternoon of October 25, 1996, my brother Sean and I had hiked to the established overlook west of milepost 123 near Middlefield, Massachusetts. The roar of EMD 20-Cylinder 710 diesels announced the passage of a westward freight with two of the relatively new Conrail SD80MACs. I exposed this view using my Nikon F3T. From the Closet: Ektachrome Rejects from March 1987. When I was at the Rochester Institute of Technology, once or twice a year Kodak would gift photo students with a selection of new products to try. On this occasion, I had been given a sample of two rolls of the latest Ektachrome. A professor gave us a vague assignment to make color photographs, so I wandered up to Lincoln Park, a junction on Conrail’s Water Level Route west of downtown Rochester, New York, and exposed these photos. There I found local freight WBRO-15 working with GP8 7528. The crew was friendly and quite used to me photographing of their train. Back in 1987 my serious railroad photos were exposed using 120 black & white film or on Kodachrome 25. These Ektachromes were an anomaly. After the assignment was turned in, I relegated the remaining images to my ‘seconds box’ and forgot about them—for 31 years! I found them back accident the other day, and so scanned them post haste. You mean pairs of Conrail SD50s aren’t common any more on Water Level Route road freights? I thought my Rochester friends would get a kick out of seeing them. How much has changed since March 11, 1987? Tracking the Light EXTRA: Happy Birthday Conrail! The Consolidated Rail Corporation began operations on April 1, 1976. 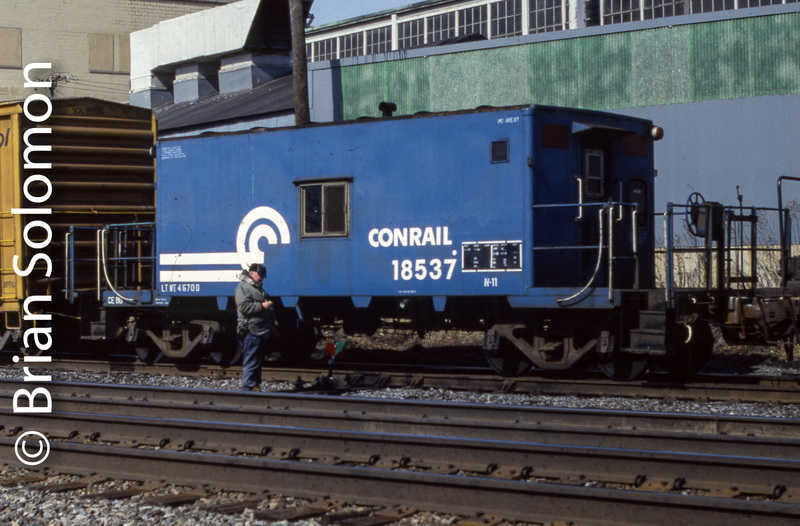 During the 1980s and 1990s, I made thousands of Kodachrome slides of Conrail operations. Conrail was divided between Norfolk Southern and CSX in Spring 1999. 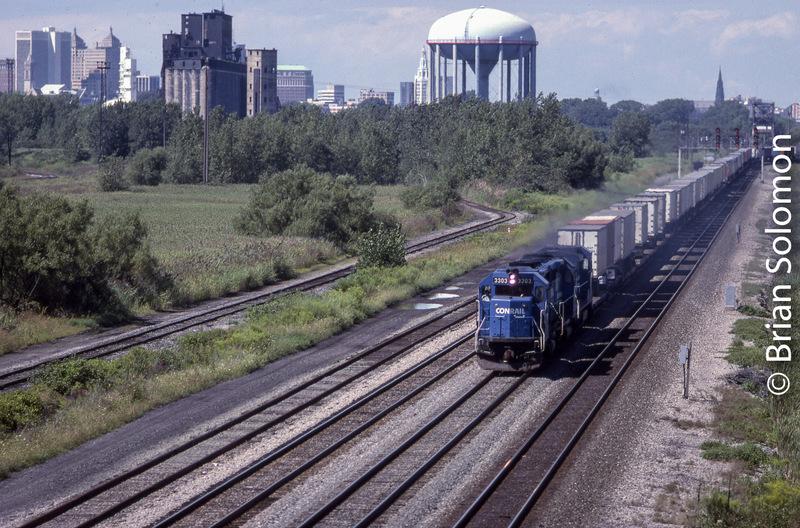 In August 1988, I exposed this view from Tifft Street in Buffalo of a westward Conrail intermodal train working the Water Level Route. Tim Doherty and I authored a book on Conrail in 2004. Exposed on Kodachrome 25 with a Leica M2 and 90mm Leitz Elmarit lens. I cross-lit the train in an effort to emphasize the Buffalo skyline and help distinguish the four track line. Classic Angle at the Diamond. I knew it as the Boston & Albany and Central Vermont diamond in Palmer (diamond describes the shape of rails made by the angled level crossing of the two lines). I made my first photos at this location before I entered 6th grade. Fast forward to January 2, 2018. I stepped out of the car at Palmer and with the crisp winter air I could hear a train approaching eastbound. So often my ears have alerted me to a train. In this case the two-cycle roar of classic EMD 645 diesels. I ambled toward the diamond and made these views. Over-the-shoulder light, with rich mid-morning sun, at a readily identifiable location; nearly perfect. Working with my FujiFilm X-T1 with 27mm lens, I exposed a sequence of images designed to mimic the angle I’d used here many years earlier. There are more trees here now than in years gone by. Yet I’d made vertical views here before to emphasize the signal. CSX GP40-2s lead B740 eastbound over the famous diamond. CSX local freight B740 was carrying cars of pipe to be interchanged at Palmer Yard with the Mass-Central. That gave an a idea for the following day. Conrail Classic Chrome—SD80MACs at the Twin Ledges. The Twin Ledges is a classic photo location a mile or so west of the old Boston & Albany Middlefield Station in the Berkshire Hills of western Massachusetts. Conrail’s SD80MACs were an unusual modern locomotive because they were powered by a 20-cylinder variation of EMD’s 710 diesel, rated at 5,000 hp. They arrived only a few years before Conrail was bought and divided by CSX and Norfolk Southern. Although their operation on the old B&A was short-lived, they were oft photographed (by me anyway). Classic Kodachrome: a vertical telephoto view of Conrail SD80MACs leading symbol freight ML482 at the Twin Ledges in October 1996. Great Shot Forever Ruined—I missed the Focus. Hard lessons. Here we have a scene never to be repeated, and one that I’ve never dared to show before. In June (or early July 1984), I caught a westward Conrail freight passing the Palmer Union Station at sunset on the then double-track Boston & Albany.. This was toward the end of regular operation of cabooses on road freights. By that time many Conrail symbol freights on the B&A were already using telemetry devices in place of the once common caboose. A caboose rolling into the sunset. Great illustration concept. Nice light, decent framing, etc. Except the photo is soft. Working with my Leica 3A rangefinder I’d missed the focus. Viewed at a small size on a pixelated back-lit digital screen this old photo is nearly passable. But it fails my basic test for sharpness. Face it, I missed the focus. Like spilled milk, once you’ve missed the focus there’s nothing you can do about it. And so as a result of this visual flaw, the potentially iconic image didn’t make my cut of presentable images. I filed the negative, then I misplaced it. For more than 32 years it remained unseen. I present it now only as a warning. Even as a 17 year-old, nothing annoyed me more in my own photography than missing the focus. Back then there was no autofocus, so when I missed, I couldn’t blame the technology. My lesson: get the focus right. Once you’ve missed it you can’t fix it. (Although with digital sharpening you can cover your tracks a little). Palmer, Massachusetts Then and Now; 1984-2016. Conrail SEPW (Selkirk to Providence & Worcester at Worcester, Massachusetts) makes a drop at Palmer, Massachusetts on May 6, 1984. I exposed these two views from almost the same angle on the South Main Street Bridge in Palmer, Massachusetts. In 1984, Conrail operated the old Boston & Albany, and the main line was then a directional double track route under rule 251 (which allows trains to proceed in the current of traffic on signal indication). SEPW has stopped on the mainline, while the headend has negotiated a set of crossovers to access the yard and interchange. That’s the head end off in the distance. I made this 1984 view on Plus-X using a Leica fitted with a f2.8 90mm Elmarit lens. The comparison view was exposed on July 25, 2016 using a Lumix LX7 set at approximately the same focal length. Although similar, I wasn’t trying to precisely imitate the earlier view and was working from memory rather than having a print with me on site. Exposed using my Lumix LX7. I used the ‘A’ mode and dialed in -1/3 to compensate for the bright sunlight and the dark side of the train. This image was extracted from the in-camera Jpeg and compressed for internet viewing, but I also made a RAW file of the same image. Both are to be archived on multiple hard drives. 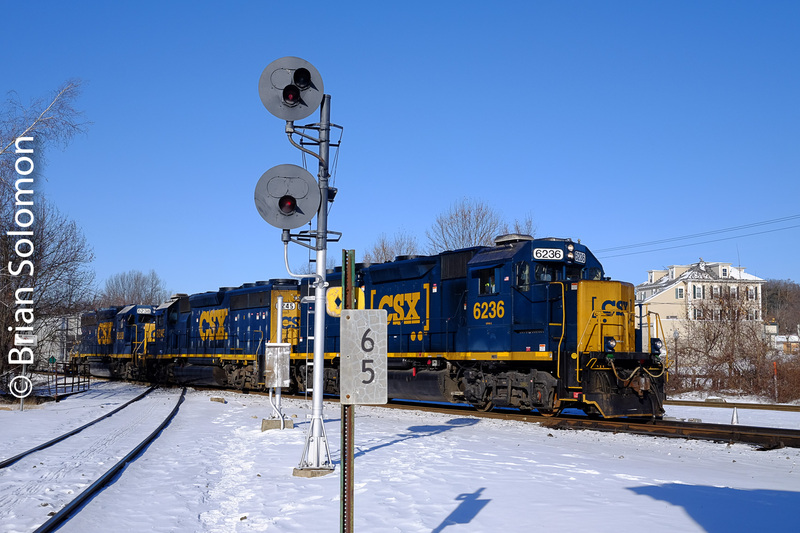 I was on my way to New London, Connecticut in late 1996 when I first learned of the news that CSX was to make a bid for Conrail. It was a big surprise to most observers. Ultimately CSX and Norfolk Southern divided Conrail. Armed with the knowledge of Conrail’s pending split, I made many images to document the final months of Conrail operations. Step back a decade: In the mid-1980s, I’d photographed the end of traditional double track operations on Conrail’s Boston & Albany line. Long rumored, the B&A’s conversion from directional double-track (251-territory) to a single-main track with Centralized Traffic Control-style dispatcher controlled signaling and cab signals began in late 1985. It was largely complete three years later. A year or so before the work began, I was sitting in an engine cab and a Conrail crewman pointed out to me that the railroad had re-laid one main track with continuous welded rail while the other line remained jointed. Sound advice. And I took it to heart. By anticipating the coming changes, I made many prized photographs of the old order—before the work began. I continued to photograph while the work was in progress, but that’s not my point. Conrail’s C30-7A and C32-8 diesels roll east with tonnage at milepost 84 in Monson, Massachusetts. In this view, I’m looking toward the Palmer diamond, and in the distance we can see Central Vermont cars for interchange. This was mid-1986. At this stage Conrail was still operating the B&A as a traditional directional-double track railroad, much the way it had been operated for decades. Yet, it was only a matter of weeks before the old westward main (seen here with jointed rail) would be removed from service. . By anticipating the changes to the railroad, I could emphasize the elements soon to change; the westward jointed track and the code lines. However, other more subtle changes also resulted. Without the old signals, the code lines came down, and the bushes and trees grew in their place. Having observed New England railroading for the better part of four decades, I again have a sense that change is in the works for railways in the region. Will today’s operators remain as they are for long? Will traffic soon find new paths and may some lines—now active—dry up? Will those antique locomotives, more than four decades on the roll soon be sent for scrap? Those are the questions we should think about. Take nothing for granted and keep a sharp eye for images. While, my crystal ball remains clouded, I’ve learned not to wait for the big announcement. I hate standing in lines to get my photos or realizing I missed an opportunity when the time was ripe. Act now and stay tuned. Tracking the Light Offers Insight and Stories Daily. So it read on one end of Conrail’s specially painted New England Division caboose. Ironically, on this day that ‘end’ of the caboose that was facing inward toward the freight cars. I made these photos at the end of the day at Tennyville in Palmer, Massachusetts. The freight was Conrail’s PWSE (Providence & Worcester to Selkirk). These were among my reticulated negatives in my lost photo file described in detail in yesterday’s post (see: Conrail-Visions from another era.) They were exposed in Spring 1984. Conrail’s one of a kind New England Division Caboose spent a couple years on the Boston & Albany in the mid-1980s. Sometime after Division Supt E.C. Cross retired it was sent west to New York State where it became the Buffalo Division Caboose. I have more photos of it out there. Most of them sharper than these. Interestingly, my unintentional and inept processing of the negatives resulted in producing better tonality in the sky. This was at the expense of sharpness and granular uniformity however. Looking west at Palmer, Massachusetts in the Spring of 1984. If you look carefully, you can spot the headlight of PWSE’s headend working Palmer yard to make a pick up. That’s the old Route 32 bridge over the tracks in the distance. Interestingly, my unintentionally inept processing of the negatives resulted in producing better tonality in the sky. This was at the expense of sharpness and granular uniformity however. For more than 30 years these negatives were stored unlabeled in a white envelope. I scanned them last week; and using digital post-processing techniques I was able to adjust the contrast to partially compensate for the damage in processing. I featured this caboose in my first book on American railroad cabooses authored with John Gruber and published by MBI. Conrail-Gauzy Visions from another era;—the Lost Photo File, Part 2. Sometimes by getting it wrong, I got it right. It was Spring 1984 when I made this black & white photo of Conrail’s SEBO-B climbing east through Warren, Massachusetts. Until a couple of day’s ago, this negative was lost and unprinted, part of a group of Conrail negatives on the Boston & Albany. When I first relocated these images after 32 years, I was puzzled. What had happened and Why? In 1984, I’d typically use Kodak Microdol-X as my black & white developer, aiming to work with this solution at 68 degrees F.
To mix the solution from powdered form, I’d have to bring the temperature up to about 120 degrees F, then let it cool (often in glass bottles soaking in ice water). I must have been in a hurry, and in this instance, I’d failed to allow the developer to cool properly. When I processed the negatives the solution was still over 80 degrees F. Worse, the rest of my chemistry was still at 68 degrees. The result was that my photos were grossly over processed, but since the developer was highly active, it affected highlights and shadow areas differently. This provided much greater shadow detail to highlight detail than I’d normally expect. Also, the shock to the emulsion when I dropped the hot film into relatively cool stop bath solution caused it to reticulate. Reticulated emulsion results in grain clumping that lowers the sharpness, produces a ‘halo-effect’, and creates a speckled and uneven grain pattern that is most noticeable in even areas such as the sky. Since the negatives received much greater development than usual, they are very dense, and back in my day printing photos in the family kitchen, were effectively unprintable. This enlargement of the front of the engine shows the effects of reticulated grain structure. When processed as intended Kodak Tri-X can deliver a relatively fine and even grain structure. Here we have a mottled speckled structure caused by shock from a very hot developer followed by the cool stop bath. With modern digital scanning and post processing techniques, I was able to overcome difficulties with the density and contrast. In the Spring of 1984 (second week of May based on the freshly leafing trees) I made this early evening image of Conrail’s SEBO-B working east through Warren, Massachusetts on the B&A route. (SEBO = Selkirk to Boston). I find the end result pictorial. Perhaps, it’s not an accurate rendition of the scene, but pleasing to the eye none-the-less. I’m just happy I didn’t throw these negatives away. After all, Conrail SD40-2s were common, and I had plenty of opportunities to photograph freights on the B&A. Tracking the Light is Daily! Tracking the Light Extra: Rochester, New York—Conrail Shadow. The purpose of this image was intended as a test of Kodak’s new T-Max 100 black & white film. Exposed with a Canon A-1 with 50mm lens. I made this view of Conrail GP40-2s rolling east at Rochester, New York’s Amtrak station in November 1986—nearly 30 years ago. At the time, Conrail was the order of the day, and the GP40-2s were common. Although sharp and properly exposed, this view was marred by the shadow of the canopy and so at the time I disregarded it. I’ve amended my opinion, however. Now the whole scene has changed beyond recognition. Conrail is gone nearly 17 years and last year Amtrak demolished its old station in preparation for construction a new one. 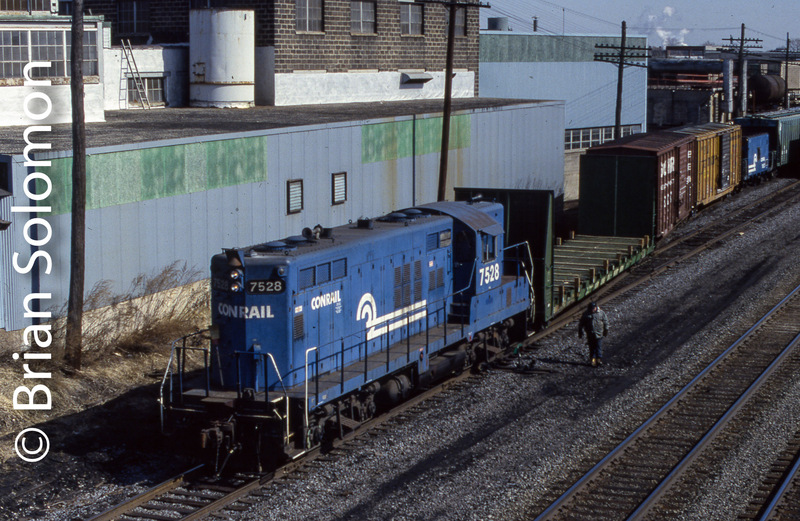 Conrail Coal Train in 1988. It was a hazy sunny August morning when I exposed this trailing view of a Conrail coal train east of Bennington Curve on the famous former Pennsylvania Railroad grade between Altoona and Gallitzin. Exposed on Kodak Verichrome Pan black & white negative film using a Rollei Model T (with Zeiss f3.5 75mm Tessar lens) with 645 (superslide) insert. Processed in Kodak D-76 diluted 1:1 with water. Negative scanned with an Epson V750, contrast adjusted electronically. Conrail SD40 at Bullards Road, Washington Summit. Conrail eastward freight at Bullards Road, Hinsdale, Massachusetts on August 3, 1984. Take notice the former Erie Lackawanna SD45-2, Conrail 6659, second out. Some of those old EMD’s are still on the move. This day it’s 20-cylinder 645-diesel was adding to atmosphere. (Fear not, I have plenty of photos of the SD45-2s on the B&A and elsewhere on Conrail). Looking back more than three decades; it was a warm August 1984 afternoon when my pal T.S.H. and I sat up on the grassy hill near the popular Bullards Road Bridge to photograph this Conrail eastward freight as it approached Boston & Albany’s summit of the Berkshire grade. I made this image on 35mm Kodak Tri-X using my Leica 3A with a Canon 50mm lens. 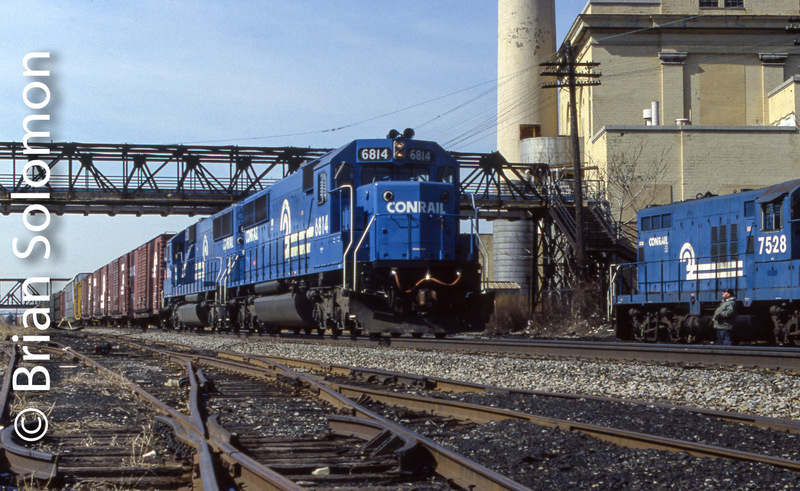 Conrail was divided in Spring 1999, nearly 15 years after this photo was exposed. In 2003, CSX removed the old Bullards Road bridge (and stone abutments). I can’t say for certain what happened to the SD40, but a similar former Conrail engine still works for New England Central. Personally, I’d trade my digital cameras for a fully functioning time machine. Conrail at 10 mph; Arkport, New York on the old Erie Railroad. It was April 1989 when I exposed this view of Conrail’s BUOI (Frontier Yard Buffalo to Oak Island, New Jersey) bumping along the number 2 track at Arkport, New York. At that time this portion of the old Erie Railroad line from Hornell to Buffalo as still directional double track (rule 251) with block signals largely in the from of antique Union Switch & Signal Style S semaphores. A 35mm black & white photograph exposed using a Leica M3 rangefinder with 90mm lens. That’s my old (then new) Bogen 3021 tripod that I’d lent to a fellow photographer ( seen at left). Between Hornell and Hunt, New York, Erie’s old eastward main wasn’t maintained for speeds faster than about 10mph, and when possible Conrail routed traffic against the current of traffic on the westward (number 1 track.) Not on this day though. I was working with two Leica M rangerfinders that day; I made a similar view on Kodachrome slide film with my M2 that appeared in RailNews for its ‘Farewell to Conrail’ issue back in 1999 (a little more than ten years after I exposed it). While Conrail was only an extant player in American mainline freight operations for a little more than 23 years, it was my favorite of the big eastern railroads. Upper Quadrant Semaphore on the old Erie Railroad. Not on ‘Tracking the Light’? Click on Brian Solomon’s Tracking the Light for the full image and story. In the 1980s, I made hundreds of images of upper quadrant three-position semaphores along the old Erie Railroad in New York State, a line then part of the Conrail system. A Union Switch & Signal upper quadrant semaphore blade, exposed on Kodachrome 25 using a Leica M2 with 200mm Telyt lens. I focused on this semaphore near Tioga Center, New York in August 1988. This is part of a sequence that portrayed the signal in its three position and this image is of the ‘approach aspect’. Learn more about American semaphore practice in my book, Classic Railroad Signals published by Voyageur Press. Amtrak Montrealer Detours! 30 Years Ago Today—March 15, 1986. It was a day of big excitement. Up north, Guilford was in a knot as result of a strike action. Bob Buck phoned me early in the morning to say that ‘The Boot’ (the colloquial name for Amtrak’s Montrealer) was detouring to Palmer on the Central Vermont, then west on the Boston & Albany (Conrail). Using my dad’s Rollei model T loaded with Kodak Tri-X, I made the most of the unusual move. This was nearly a decade before Amtrak’s Vermonter began to regularly make the jog in Palmer from the CV/New England Central route to the B&A mainline. And, it was only four months before Conrail ended traditional directional double-track operations between Palmer and Springfield. Amtrak 61 followed CV’s southward road freight to Palmer arriving at 11 am with Canadian National M-420 2557 in the lead.. Here I pictured it near the old Boston & Albany freight house in Palmer, Massachusetts. Note the all heritage consist (except of course for the F40). An Amtrak CF7 had come out from Springfield to assist with the reverse move necessary to bring the Montrealer westward over the B&A. I’d met some photographers at the Palmer diamond and encouraged them to take advantage of my favorite vantage point at the rock cutting at milepost 84, just over the Quaboag River from the Palmer Station. As detouring Amtrak number 61 approached with a former Santa Fe CF7 leading the train to Springfield, we could hear an eastward Conrail freight chugging along with new GE C30-7As. Moments after I exposed the classic view of this Montrealer working the old number 1 track, TV6 blasted east with intermodal piggybacks for Worcester and Boston. I was using the Rollei with a 645 ‘Superslide’ insert that allowed me 16 frames per roll. Conrail TV6 passes Amtrak’s Montrealer on the double track west of the Palmer diamond. Four months later, in July 1986, Conrail cut-in CP83 which ended double track operations between Palmer and the new CP92 in Springfield. Sometimes when the action is unfolding its best to just keep exposing pictures. Here I was cranking the Rollie as quickly as I could. This is among my favorite sequences that show the old double track in action. Some of these photos later appeared in Passenger Train Journal. Long before I was the Associate Editor of that magazine.